Shark Pups: Tues & Thurs, 5:00 - 6:00 p.m.
Reef Sharks: Mon/Wed/Fri, 5:00 - 6:00 p.m.
Mako Sharks: Mon - Thurs, 5:00 - 6:15 p.m.
Hammer Heads: Mon - Thurs, 6:15 - 7:30 p.m.
Threshers: Mon - Thurs, 6:00 - 7:45 p.m. and Fri 5:00 - 6:45 p.m. 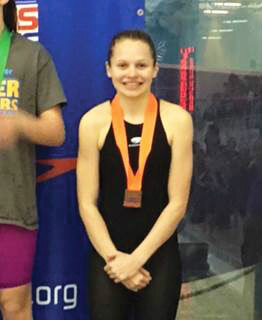 The Byron Tiger Sharks Swim Team is a competitive age-group swim team affiliated with Illinois Swimming and the United States Swimming Associations. We have five ability groups, in which your child can develop and improve his/her swim stroke technique and endurance while advancing competitively. You can view the team's website at www.byrontigersharks.org where practice, swim meets, and other information is available. You may also contact Nick Warrner at 815-234-6218 or email nwarrner@byronparks.org for more information. Tiger Sharks enrollment will be broken down into monthly sessions. Participants must be enrolled in the current session in order to participate. Registration can be completed in person at the Park District front desk (420 N Colfax St. Byron) or online at byronparks.org (click "Register Online"). A sibling discount of 15% is offered for families who enroll more than one child. Swimmers at ALL Tiger Sharks levels are required to become members of USA Swimming, which is a $77 annual fee or a $20 flex membership fee. Flex memberships only include a max participation of two swim meets. New this year! This program is available to high school swimmers who are looking to stay in water shape at a reduced commitment to gear up for high school swim seasons. Sessions will be held at the Byron High School Pool Monday, Wednesday, and Friday from 10:15 a.m. - 11:30 a.m. The cost is $68.00 for residents and $78 for non-residents. Our diving course will be designed as two different groups, first as an introduction to the sport of Springboard diving for people new to the sport. These participants will be taught the rules, safety procedures, proper approach and execution of basic dives in the five dive categories to build a foundation for future learning. Second, coaches will work with intermediate to experienced divers to advance their dive list and skill level. 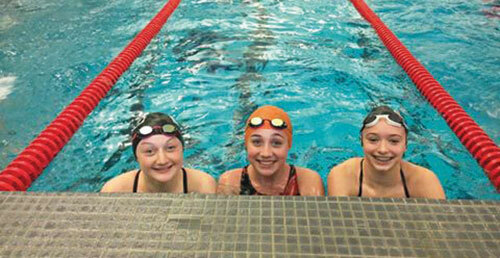 Sessions will be held at the Byron High School Swimming Pool, Mondays and Wednesdays, June 3 - 14, from 5:30-7:30 p.m. The cost is $65.00 for residents and $75 for non-residents. These two skill groups are intended to bridge swimmers from swim lessons into competitive swimming. The prerequisite is the ability to swim front and back crawl unassisted for 25 yds each. In this training group, all four competitive swim strokes (freestyle, backstroke, breaststroke &butterfly) will be taught. Swimmers will also be introduced to racing starts and turns. Participation in swim meets is optional. However, all swimmers MUST be members of USA Swimming. Coaches will determine based on ability level in which group a swimmer should enroll. Swimmers in these groups should be able to swim all four competitive strokes and perform racing starts and turns. The main focus of the group will be on stroke development, technique and endurance. Swimmers are REQUIRED to become members of USA Swimming and expected to attend at least one meet per session. Additional fees apply. Coaches will determine based on ability level in which group a swimmer should enroll. Swimmers in this group must be able to perform all four competitive strokes, starts and turns to USA Swimming standards and have the desire to advance competitively. 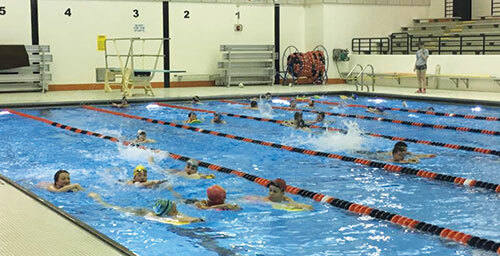 In this training group, swimmers continue to work on stroke technique, with the main focus on conditioning and competitive skills. Dry land exercises will be incorporated into workout times. Swimmers in this group are REQUIRED to become members of US Swimming, expected to attend a minimum of one meet per month (additional fees apply).